Over the past years, we have become used to Europe’s debt crisis. However, the fiscal problems of countries such as Greece are only the tip of the iceberg. Europe’s crisis has much deeper roots. In this essay, Dr Oliver Hartwich presents a sketch of Europe’s decline. The continent that invented and dominated the modern world has gambled away its future. Run by distant and unaccountable political elites, the EU embarked on a project of political integration for which there was never any popular appetite. At the same time, government spending across the continent increased to levels never before seen in history. To make matters worse, Europe’s population is ageing and shrinking. 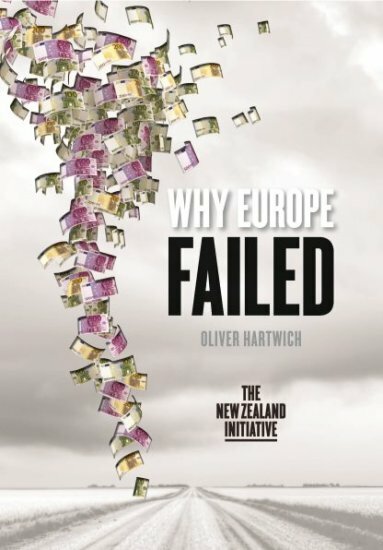 Why Europe Failed is a sobering account of the Old World’s fall from grace. It also contains a warning not to repeat Europe’s mistakes elsewhere. Oliver is the Executive Director of The New Zealand Initiative. Before joining the Initiative he was a Research Fellow at the Centre for Independent Studies in Sydney, the Chief Economist at Policy Exchange in London, and an advisor in the UK House of Lords. Oliver holds a Master’s degree in Economics and Business Administration and a Ph.D. in Law from Bochum University in Germany. He has been covering the European crisis as a weekly columnist for the Australian magazine Business Spectator since February 2010.